Awaiting governments to confirm their attendance at the Mekong People’s Forum next week. 5 November 2015 – On 25 September 2015, local people’s networks in Cambodia, Thailand and Vietnam released a joint statement entitled: “Mekong governments: Listen to the people! – Statement by local people on dams in the Mekong Region” (attached). The statement calls on the governments of the Mekong region to recognize the severe impacts of large-scale hydropower dams on the Mekong mainstream and tributaries within the Mekong basin and to listen to the concerns of local communities who would be affected by these projects. 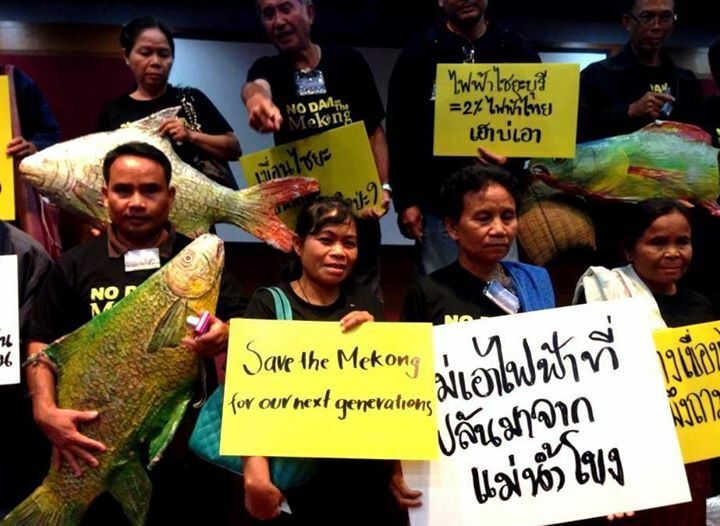 Community lawsuit against Xayaburi Dam at Thailand’s Administrative Court in June 2014. Photo by: Stop Xayaburi Dam. The original statement was signed by 15 local representatives from three countries plus 10 supporting organisations and one academic as an individual supporter. One month later, the statement has received recognition and support from more than 4,500 signatories. Among all those who signed, over 4,000 signatures and thumbprints come from the local people who live along the Mekong River and have directly experienced the changes in the Mekong River in recent years. All the signatures, with the total to be counted early next week, will be presented to government ministers from all four lower Mekong countries; those who are directly responsible for decision-making over the future of the Mekong Basin. Invitations were sent, together with copies of the statement, to Ministers of Cambodia, Thailand and Vietnam, to invite them to the Mekong People’s Public Forum, which will take place on 11 November at An Giang University, An Giang Province in the Mekong Delta in Vietnam. The Regional Public Forum, “Local Mekong people’s voices: the message to Mekong governments on Mekong dams”(program attached), will be a gathering of nearly one hundred participants. Among them will be at least twenty representatives from local Mekong communities from Cambodia and Thailand. The majority of participants will be Vietnamese local communities, civil society groups and academic groups from Vietnam. This event is highly significant: it will be the first public forum of its kind, bringing together local people across the region to share their concerns over hydropower dams. The Mekong local groups, however, until now are still waiting for the formal reply from the Mekong governments as to whether they are willing to join the historic Mekong People’s Forum. “This forum belongs to us, the local Mekong people’s communities and citizens. I believe that the gathering will get bigger and bigger from now on. The problems from Mekong dams have been too severe for all of us, and without any real solution and understanding from Mekong governments, we the people will no longer able to protect our rivers from the aggressive encroachment of those dam builders. We will therefore continue to call until we have the government representatives really come, listen and admit their responsibility in protecting the Mekong basin, our livelihoods and the security of the region overall” states Mr. Channarong Wongla, from the local group Hug Chiang Khan in the Northeastern Mekong provinces in Thailand. Since 2008. Save the Mekong Coalition. Some rights reserved.